We offer lap flanges, which is manufactured from top grade materials, thus meeting the various requirements of our clients. These are available in various sizes, grades and dimensions. As per the requirement of our large clients we can also provide customized solutions within the committed time frame. Quality Forge & Fittings are Manufacturers, Supplier, and Exporters of Lap Joint Flanges in india. Our qualitative range of Lap Joint Flanges is exclusively designed for several piping applications of various industries. These are designed and developed in accordance with the international quality standards. Lap Joint Flanges that are precision engineered using the best quality raw material. We also customize these industrial flanges as per the requirements of the clients. 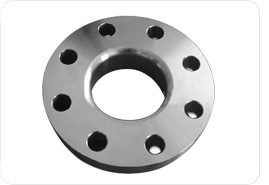 Quality forge and fitting is leading suppliers of Carbon Steel Lap Joint Flanges in INDIA. Quality Forge and Fittings is India's most trusted Carbon Steel Lap Joint Flanges suppliers in India. Quality Forge and Fittings have maintained to make a name as Carbon Steel Lap Joint Flanges suppliers and manufacturers in INDIA. Quality Forge and Fittings is an ISO 9001:2008 certified company that has been in existence since 2003. Carbon Steel Lap Joint Flanges is a flange or forged ring that is designed to connect pipe or any other machinery designed to or requires to have an intermediate connecting point. Our Carbon Steel Lap Joint Flanges contain prime quality materials. factory-made from quality steel meeting ASTM and/or AISI standards as a result of higher the standard, higher is that the toughness of the Carbon Steel Lap Joint Flanges. prime quality of steel content makes a Carbon Steel Lap Joint Flanges harder and will increase its hardness. Quality Forge and Fittings is specialized in manufacturer and suppliers of Carbon Steel Lap Joint Flanges in India. Quality Forge and Fittings may be a certified manufacturer and suppliers in India. Quality Forge and Fittings is wide common in India for its prime quality Carbon Steel Lap Joint Flanges product. Our purchaser's satisfaction depends on a variety of things like quality, Toughness, Hardness, Carbon Content, Delivery Time and our Services for Carbon Steel Lap Joint Flanges. Quality Forge and Fittings may be a Indian suppliers of Carbon Steel Lap Joint Flanges in INDIA. Quality Forge is also a leading supplier, manufacturer and dealer of other flanges such as Stainless Steel Flanges, Alloy Flanges in INDIA. Quality Forge also is a market leader of other products such as ANSI B 16.47 Series A Flanges, ANSI B 16.47 Series B Flanges, ANSI B 16.5 forged Flanges, Carbon Steel Flange, Stainless Steel Flexible Hose Pipe, API 5L Pipe, Weld Neck Flanges, Slip-On Flanges, RTJ Flanges, Spectacle Blind Flanges, Carbon Steel Awwa Flanges, Carbon Steel Lap Joint Flanges and many more other products in INDIA. Quality Forge and Fittings manufacturers and provides solely quality tested and difficult Carbon Steel Lap Joint Flanges. Carbon Steel Lap Joint Flanges at Quality Forge and Fittings bear several toughness and hardness check before provision it to our purchasers. we've over 97% happy purchasers. QUALITY FORGE AND FITTING IS WORLD LEADING SUPPLIERS OF Carbon Steel Lap Joint Flanges. Product dependability and performance has created quality forge & fitting leading businessperson, manufactures and suppliers of Carbon Steel Lap Joint Flanges in India. Each month we tend to export Carbon Steel Lap Joint Flanges product to India port around sixty-five containers to completely different customers. Our prime quality of Carbon Steel Lap Joint Flanges, sensible client service, and in-house Carbon Steel Lap Joint Flanges processing capabilities have made us one of the emerging and leading supplier for Carbon Steel Lap Joint Flanges in INDIA. Our product Carbon Steel Lap Joint Flanges area unit exported frequently to over sixty-five countries. Over last twelve Years we tend to had equipped over 2500+ plenty of carbon Carbon Steel Lap Joint Flanges to India. Orders at Quality forge and fitting area unit secured quick delivery of Carbon Steel Lap Joint Flanges in India. the most reason being we've a wonderful reposition and storage facilities for each finished and semi-finished merchandise. they're finished as per the pressing necessities of the shoppers. Orders at Quality forge and fitting are guaranteed fast delivery of Carbon Steel Lap Joint Flanges in India. The main reason being we have an excellent warehousing and storage facilities for both finished and semi-finished goods. They are made ready as per the urgent requirements of the customers.